It doesn't get much more heartbreaking than this. 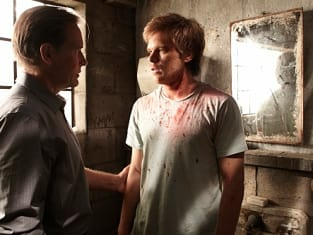 Rita's body is taken away on the fifth season premiere of Dexter. Dexter Season 5 Episode 1: "Season Five Premiere"
His wife just died; he's submitting a lab report. Permalink: His wife just died; he's submitting a lab report. I've watched 67 people die, and at the moment of truth I looked into their eyes and I knew - and they knew - they got what they deserved. But what if that's not what happens, if you don't get what you deserve?